The Plane That Changed The World ! By the late 1920s, many people (all over the world) were flying. Airline companies were started everywhere. United Air Lines, Transcontinental and Western Airlines (TWA) and American Airlines all had major operations in the United States. Most of the airlines flew trimotors, like Fokker F-10s and Ford ATs. But the standard of those days was World War I technology, aircraft built around a wooden frame. They flew low and slow and maintenance was a pain in the whatsit. Disaster struck when in those days famous (US) football coach Knute Rockne died in a crash of a TWA Fokker F-10. The Douglas Commercial Type One, a.k.a. DC-1, came about as an answer to the maintenance problems the airlines were having, which were obliged to follow up on maintenance schedules described by the Bureau of Air Commerce (foreruner of the present FAA). Boeing had produced the Model 247, which did the same, but United Air Lines had ordered 60 and Boeing did not have the capacity to produce for others as well. TWA wanted a modern plane too, to the same advanced specifics (initially prescribing a 3-engined aircraft) and went to Douglas. Douglas produced the DC-1 and roll out at Santa Monica, California happened on 23 june 1933. One difference with the Boeing 247 was immediately clear: passengers could walk upright in the cabin ! TWA had asked Douglas to produce an aircraft that would be able to take off from any TWA destination after one engine failure. Maybe not such a strange request, considering the initial request for a 3-engined aircraft and the unreliability of engines in those days. But Douglas produced the DC-1 with only 2 engines, now what about its performance after an engine failure in take off ? But they pulled it off and this was proven with a test flight on one engine between Albuquerque, New Mexico (the highest point on the TWA route) and Winslow, Arizona. A magnificent feat. TWA took delivery of the DC-1 in December of 1933 and paid the bill for usd 125.000 (the prototype had cost Douglas $ 807.000 to produce). And TWA showed its confidence and ordered 20 "improved DC-1s" (later redesignated DC-2s). Meanwhile the U.S. Military had shown interest in the design as well, they were looking for a modern cargo/troops transport. As a matter of fact, the DC-1 was used by TWA and Douglas to set various speed records, including one trans-continental record of 3.107 miles with an average speed of over 272 mph; this "passenger plane" was flying rings around fighter aircraft of those days ! The DC-2 was slightly longer than the DC-1, good for a total of 14 passengers. The engines initially used were Wright SGR-1820-13 Cyclones. They were good for 875 hp on full take off setting. Except for TWA, the DC-2 was also ordered by the US Navy (5 staff transports, designated R2D-1, 3 for the Navy and 2 for the Marines) and the US Army Air Corps (XC-32 and when WW2 started, impressed (drafted) 24 DC-2s and designated them C-32As). The US Army also needed a cargo transport and thus was the floor reinforced, all plush seating and furnishings taken out and a large door was cut in the aft portside of the fuselage for cargo loading. This model was designated C-33 and 18 were built. The US Army also flew 2 C-34s, basically the same as the XC-32. The C-39 was the top of the line in the military DC-2 variants, and was a cross between the DC-2 and what was to become the DC-3. It had larger vertical and horizontal tail surfaces (solving an instability problem in the DC-1/DC-2 design). The center wing section/engine nacelle assembly and undercarriage were also of the DC-3 design. It had a larger cargodoor and it was powered by Wright R-1820-55 Cyclone engines (975 hp). Deliveries started in 1939 and 35 were built for the USAAF. They were built alongside the DC-3, but the USAAF was not interested in the larger DC-3..... not until the Japanese made their attack on Pearl Harbor and everyone scrambled for the DC-3s ! Originally the DC-3 was designed as a luxury sleeper airliner, dealing with the longer distances and longer flighttimes people now wanted to travel. The DC-2 was not wide enough to accommodate a comfortable berth. By a combination of berths and seats, the DC-3-DST (Douglas Sleeper Transport) was designed. A brand new DC-3 rolled out from the factory. Photo courtesy © Eric Birkeland. 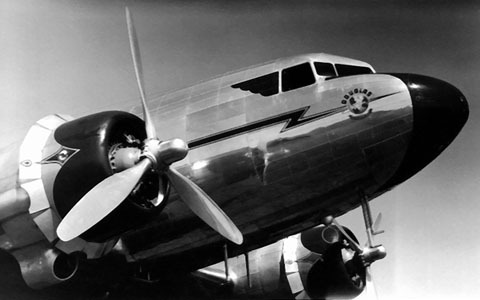 American Airlines (the driving force behind the DC-3 design) introduced it into service on the non-stop New York - Chicago "American Eagle" run in June 1936 and it was an immediate success ! It was immediately followed by orders of other U.S. and overseas airlines. Air travel in the US from coast to coast was reduced to a mere 15 hours ! The big change was that previously operators were depended on mail contracts to make money on their routes, and now with the DC-3, airlines became independent from the US mail contracts as the economics of the aircraft resulted in profits. The price of a DC-3 was in a range of $ 82.000 to 110.000 and as a logical extension of the DC-2, it did not incorporate revolutionary technology, but the actual breakthrough were the economics. The DC-3 became the standard airliner of the world and put the American aviation industry in a leading position. The maiden flight was made on 17 December 1935 and by 1937 the production was up and running with a full orderbook, producing in December alone 37 examples. By the time the US became involved in World War 2 in December 1941, a total of 507 DST/DC-3s had been produced (of which 434 had been delivered to commercial airlines). Many of these were drafted by the military for the war effort. By initiative of United Air Lines, which had connections with Pratt & Whitney, the DC-3A was produced. It featured the more powerful P & W R-1830 Twin Wasp powerplants. This became the definitive version of the DC-3 for the civil and military operators. The DC-3A went into service with UAL on 30 june 1937 and with UAL too it showed a profit from the start. The USAF Museum has something on this engine, click here, and use your back button to come back here. Braniff Airlines followed with an order for 4 21-seats DC-3s in August 1939. Pan American Grace Airways (Panagra) in South America was an early customer, Panair do Brasil followed when they got rid of their Sikorsky S.42 flying boats and replaced them by DC-3s. Many other operators followed. By 1938 the DC-3 was carrying 95 percent of all commercial airline' business in the US and was in use with 30 foreign airlines all over the world. It was KLM (Holland's "Koninklijke Luchtvaartmaatschappij voor Nederland en Kolonien" under the visionary leadership of its first managing director Dr Albert Plesman) that set the pace in Europe. In 1936 KLM placed an initial order for 11 DC-3s, with 13 more to follow. It replaced the DC-2s on routes to the Far East. 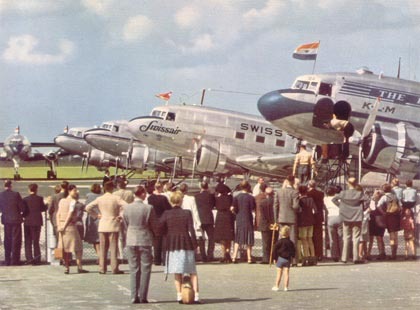 Other early Douglas operators in Europe were Swissair and Air France (with both the DC-2 and DC-3), Aktiebolaget Aerotransport of Sweden, Sabena of Belgium and LOT Polish Airlines. Douglas built the DC-3s for Europe and shipped them across the Atlantic with Fokker in the Netherlands assembling them and making delivery under contract. For the many military variants, please have a look at my page about the C-47 Skytrain. After the World War 2, hundreds and hundreds of airfields could be used to set up an air system, using the enormous amount of war surplus transports that became available. The C-47/DC-3 was easily adaptable for all sorts of operations and available in a generous amount. Prices for a secondhand DC-3 ranged from $8.000 to $15.000. Of course, many were scrapped and sometimes confiscated (e.g. by the Chinese Air Force). The Douglas Aircraft Company put some 21 former military C-47s on the market, that had not been delivered. They were configured to pre-war airline standard with 21 passenger seating. The large cargodoor was replaced by a hinge-down air stair. These were the last DC-3s built, totalling 10.665 ! The last one was cn12276, delivered to Sabena as OO-AWH on 21 March 1947. It crashed in thick fog while landing at London Heathrow on 02 March 1948. And why did the British name the DC-3 Dakota ? Ian Nel provided the explanation: Douglas Aircraft Company Transport Aircraft = DACoTA, hence Dakota ! Thousands of C-47s military transports were converted all over the world, in various configurations, suited for the task in mind. Many improvements were sought, including a four engined version of the DC-3 (a proposal by Douglas, which did not materialize). A "Maximiser"-kit was designed by AiResearch, which resulted in a 20mph increase in speed and a few other benefits. The one program of modifications that did significantly improve the DC-3, was the Douglas DC-3S (Super DC-3). But that is another story and will be published on this website on another page. For now, there are still hundreds of the C-47s/DC-3s about, either stored, preserved (sometimes even airworthy) or actually still making money on a commercial basis. And if it wil ever be grounded, it will not be because it went unsuitable for the job at hand, but because of unavailability of the hundred-octane fuel, fuel costs, lack of spare parts and suchlike. But for now I don't see the end of the line, yet (fortunately!). In the early-1950s the KLM launched an add campaign in conjunction with SPAR Supermarkets (in the Netherlands). The campaign was titled "For travel: KLM - for the housewife: SPAR". This is one image of that campaign. The photo depicts a scene at Amsterdam Airport Schiphol and the relaxed atmosphere of people seeing travellers off or merely watching planes arrive and depart, is a far cry from the security paranoia we have to suffer these days (anno 2007)! I share your enthusiasm for all the old workhorses with round engines, having flown many trips as a first officer and captain with Pinehurst Airlines from June 1977 until October 1979. I also flew for BosAire from March 1980 until July 1980 as a captain. Pinehurst had seven DC-3's of which three were based in Pittsburgh,PA where I was stationed. The others were in Charlotte,NC and Boston,MA. N148D was based at Pinehurst,NC and never flew while I was employed. The other6 were rotated around for maintenance. They were as follows: N136D, N132D, N6896, N166E, N3433P, N52V. I flew three runs out of PIT for Emery Airfreight carrying average loads around 6,000 lbs. We loaded the freight using pallet jacks and brute strength. The floors were diamond plate steel and very slippery in the winter with snow and ice brought in with the pallets. Of course we flew in the worst conditions possible across the great lakes and eastern PA hills. My short time with Bowman out of Anderson,SC I flew runs from ATL to CLT, CAE, and RDU for UPS Blue Label. I mainly flew N3BA, but also got time in N4BA (later renumbered N305SF), N18255, N12BA, and N230D later renumbered N19BA. Jake Bowman was really old school and he expected you to get the job done, no matter what, if you know what I mean. Although the loading was easier the flying was the same. I am proud that I got to be apart of the old Gooney Bird and lived to tell about it. As a side note, my dad flew C-47's in the USAF and almost died trying to pull a gear pin out of N3433H for a souvenir. 33H was parked in a lot just off the Memphis,TN airport where we lived. It was missing wings but was standing on its gear. He forced the pin and the gear collapsed with him in the well ! A friend who was with him got the airport fire department to rescue him... I don't know how they accomplished that, but I do know he was very concerned about the plane falling further and crushing him. He was quite embarrassed over the accident, but was not charged with any criminal act by the owners, Meridan Air Cargo, who had him sign a release saying he would not sue them. In regards to N3433H, it was a Meridian Air Cargo freighter (c/n 43089, ex EC-BEC according to my 1979 copy of World Airline Fleets). These events occurred in September of 1979, I believe. N132D (C-53, c/n 7328) may survive anno 2005, but where? Last operator was Texas Airways. N6896 (C-47B, c/n 33224) was registered to owners in Dominican Republic, its fate is obscure. N3433P (c/n 4346) became N513AC for Southwind Airlines and was reported 01Apr1981 at Laredo,TX; probably destroyed. N52V (C-47A, c/n 19649) may or may not survive, perhaps stored somewhere. Douglas Propliners DC-1 - DC-7, by Arthur Pearcy, by Airlife (1995). ISBN 185310261X. Excellent book, recommended !. C-47 Skytrain, in action by Larry Davis for Squadron/Signal Publications (aircraft nbr 149), ISBN 0-89747-329-0.